The seven Earth-size planets around the distant star TRAPPIST-1 are “tugging” on each other as they travel around their parent star.By carefully observing those tugs, scientists were able to gather information about the planets’ composition, and found that some of the TRAPPIST-1 worlds could have as much as 250 times more water than the amount in all of Earth’s oceans, according to a new study. Figuring out the composition of these planets is important in determining whether they could support alien life. But it’s tricky to analyze them. For starters, the system is 39 light-years away, and sending a spacecraft there is impossible with today’s technology. To put TRAPPIST-1’s distance into perspective, a spacecraft at the outer edges of the solar system, like the Voyager 1 probe, would still have to travel for over 73,000 years just to get to Proxima b, which is only about 4 light-years from Earth. Therefore, researchers at the University of Bern in Switzerland have taken creative steps to understand what each TRAPPIST-1 world looks like. The TRAPPIST-1 exoplanets are packed in a tight orbit around their dim parent star, and are so close to one another, all of their orbits would fit inside Mercury’s orbit of the sun. As the planets — which are namedTRAPPIST-1b, c, d, e, f, g and h —travel tightly, their gravity can make slight changes to the others’ orbits. An international team of scientists, led by Simon Grimm of the Center for Space and Habitability (CSH) at the University of Bern, was able to detect this phenomenon. “In the TRAPPIST-1 system, the planets are so close together that they perturb each other,” Grimm said in a statement from the University of Bern. “This causes a slight shift in the times of each transit.” (A “transit” refers to when the planet appears to pass in front of its parent star as seen from Earth. Thousands of exoplanets have been detected and studied using the transit method.) By simulating the planetary orbits of TRAPPIST-1 with an algorithm until the computational model matched what astronomers had observed in the TRAPPIST-1 system, the team could estimate the masses of the planets. From the mass data, the team could then deduce the planets’ individual densities and compositions. Intriguingly, they found that each of the five lightest planets could have about 250 times more water than the amount in Earth’s oceans according to a statement from NASA. Up to 5 percent of their composition could be water, whereas only 0.02 percent of Earth is water. TRAPPIST-1c, d and e lie close to the star’s “habitable zone,” or the region where a star receives enough radiation that water might be able to exist as a liquid on its surface. TRAPPIST-1b, the innermost planet, and TRAPPIST-1c likely have rocky interiors and atmospheres denser than Earth’s, according to the study. Of all the TRAPPIST-1 exoplanets, TRAPPIST-1d is the lightest, at about 30 percent Earth’s mass. This may mean it has a large atmosphere, an ice layer or an ocean, but scientists cannot yet discern that. TRAPPIST-1e is likely a rocky planet with a thin atmosphere. 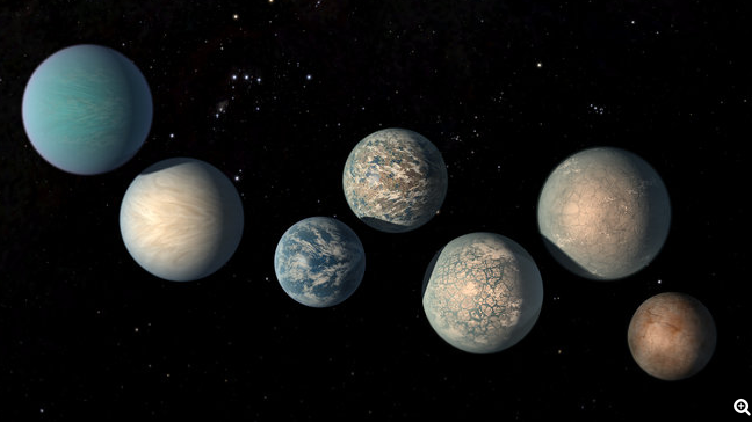 TRAPPIST-1f, g and h are so distant from their parent star that their surfaces are probably covered in ice. “We were able to measure precisely the density of exoplanets that are similar to Earth in terms of their size, mass and irradiation, with an uncertainty of less than 10 percent, which is a first and a decisive step in the characterisation of potential habitability,” said Brice-Olivier Demory, a professor at the Center for Space and Habitability and co-author of the study, which was published in late January 2018 in the journal Astronomy and Astrophysics. The size of the planet can also be estimated by looking at how much less radiation Earth sees from the star when a planet passes in front of it, according to a statement from the University of Bern. But with the transit method, scientists can’t discern how dense the planet is. And density is important, because it can offer clues as to what a planet is made of. But that’s where the close orbits of TRAPPIST-1 become especially handy. Because the planets are packed together, they slightly alter the timing of one another’s ”years.” Those variations in orbital timing are then used to estimate how heavy a planet is. When this mass is calculated and compared to the planet’s estimated radius, the researchers can figure out the density. This artist’s rendition shows what the surface of a planet in the TRAPPIST-1 system might look like. There is still much to learn about the TRAPPIST-1 system. Knowing a planet’s density doesn’t necessarily tell scientists what it’s like on the surface of those planets. For example, the moon and Mars have the same density, but their surfaces are very different, according to the NASA statement.More precise findings about the TRAPPIST-1 planets’ atmospheres and compositions can be obtained from upcoming projects, like NASA’s James Webb Space Telescope, which is scheduled to launch in 2019. An illustration shows the seven Earth-size planets of TRAPPIST-1. The image does not show the planets’ orbits to scale, but offers how their surfaces might possibility look.